Also, side note: If you see a bold colored quoted, feel free to click on the quote to share it on Twitter! According to a survey by Adobe Consumer Insights, 61% of people prefer to be marketed to via email than any other method of communication. And yes, this applied to every age demographic. In fact, by the year 2020, 64% of marketers believer email will drive the most ROI than any other communication channel. On average, people are more engaged with email on a mobile device and tend to spend 11.1 seconds per email. Speaking of engagement…. do you know when more people are engaging with email than others? …while watching tv or a movie (69% actually). As an email marketer, the “secret sauce” apparently happens on Sunday’s at 7 PM. I haven’t tested this theory yet, but you can bet your bottom dollar I am with my next email campaign. Another tip that Barber shared is to be casual with your communication. Write like you are speaking to someone one-on-one. That’s one of the easiest ways to keep readers engaged. Also, don’t make your readers “pinch and zoom” within your emails. Instead, create responsive, mobile friendly email designs. Single columns are the way to go! And speaking of design, here are a few tips for prime sizing for your text: Headlines – 30px, Body Copy – 16 px (the absolute smallest a font should be in your email is 13 px… EVER). Who knew size mattered? For text, yes, size matters. For subject line length (contrary to popular belief), it does not. But what does matter in a subject line is the sentiment/emotions provoked, contextual emoji use (if you’re going to use an emoji… which does show to increase open rates btw), simplicity (easy to read), and purpose (if you’re going to sell, sell without being spammy). One of the most interesting takeaways of the session for me was that C2A’s (call to actions… also know as buttons) shouldn’t be generic. Call to actions that are more descriptive tend to create a much higher conversion rate. For example, instead of saying, “click here,” you would instead use, “click here for greatness.” Again, I’m definitely going to test this theory. And the last tidbit of gold I’m going to share with you from the session is that if you use a name salutation in your subject line, on average, your open rates will increase by 26%. …or at least that’s what the pros say. Another session I attended related to email marketing was titled, “Top Tips to Have Your Best Year of Email Marketing Yet,” and was delivered by Nora Snoddy, Director of Marketing at Emma. When crafting a subject line, keep in mind that 86% of consumers say personalization plays a key role in their purchasing decision. According to Michael Barber, using name salutations in subject lines increases open rates by an average of 26%. I’m sure you can guess why this is my favorite takeaway… it relates to User Experience!!! …which is how a company can #gainandretain new customers/users and compete with big brands (as mentioned in my How to Connect Through Experience article). This session validated all of my recent notions/rants about UX and the need for companies to realize that if you make things difficult for users, they will go elsewhere. For successful User Experience/Customer Experience, the easiest path wins. Even if you don’t have the best product or service, you can still be the best at UX… so, “Be Bloody Brilliant” at User Experience. One of the best examples I can think of is the comparison between Kroger and Publix. They both offer essentially the same products, except Kroger offers a slightly larger variety. However, many people still prefer to shop at Publix. But, why? …because of the experience. When you walk into Publix, you generally are greeted at the door. Then, throughout the store, employees frequently ask if they can help you find something. The products are super fresh and the store is generally super clean. Whereas if you think about your last time walking into a Kroger, the experience probably wasn’t anywhere near the same experience as Publix… at least not in my town. One way to be the best at UX, according to Barber, is to treat your users like your Mom. Yep, that’s right. It makes perfect sense if you really think about it… you’re always available for your Mom and you take an enormous about of consideration when making decision surrounding your Mom’s well-being. Amirite? You should treat your customers the same way. Barber used a great example of a customer who complained on Twitter about a product they ordered and the quality of the packaging. The customer later received an email (or maybe a direct message) from the CEO of the company who apparently took the tweet extremely personal and essentially cancelled the customers order, blocked the customer from the company’s Twitter account, told them to remove their tweet, and banned them from ever ordering from their company again (since they didn’t like the product/packaging). Like WOAH! …that’s intense! I wish I could remember the company’s name so I could include the actual Tweet and email, but at the moment, I’m drawing a blank. But don’t worry… I will do a little research and update this post as soon as I can find it. Regardless, the point is, you wouldn’t talk to your Mom that way… SO WHY ARE YOU TALKING TO YOUR CUSTOMERS THAT WAY?! When your mom calls, you are always available to talk. You should be the same with your customers. If they have an issue, talk to them, work it out, make it better. Don’t make it impossible to connect with your brand. Another point Barber made was, “Bob’s Your Uncle.” If you’re British, apparently you will get this. But for everyone else, this is what it means: It’s a way of saying “you’re all set” or “you’ve got it made” and also an exclamation that is used when “everything is alright” and the simple means of obtaining the successful result. For example, “left over right; right over left, and Bob’s your uncle – a reef knot” or, “she slipped the officer $100 and, Bob’s your uncle, she was off the charge.” It’s a catch phrase dating back to 1887, when British Prime Minister Robert Cecil (a.k.a. Lord Salisbury) decided to appoint a certain Arthur Balfour to the prestigious and sensitive post of Chief Secretary for Ireland. The last point Barber made was to be kind. Although this may seem like a simple concept, for some companies/employees, kindness doesn’t come easy. However, those companies/employees that are kind and do right by their customers make the biggest impact. Simply put, if you create a culture where your employees are happy, they will go above and beyond the call of duty to ensure a positive customer experience, which ultimately translate to superior brand loyalty and trust. As you can see from only these few examples, this conference was packed full of great knowledge and takeaways. 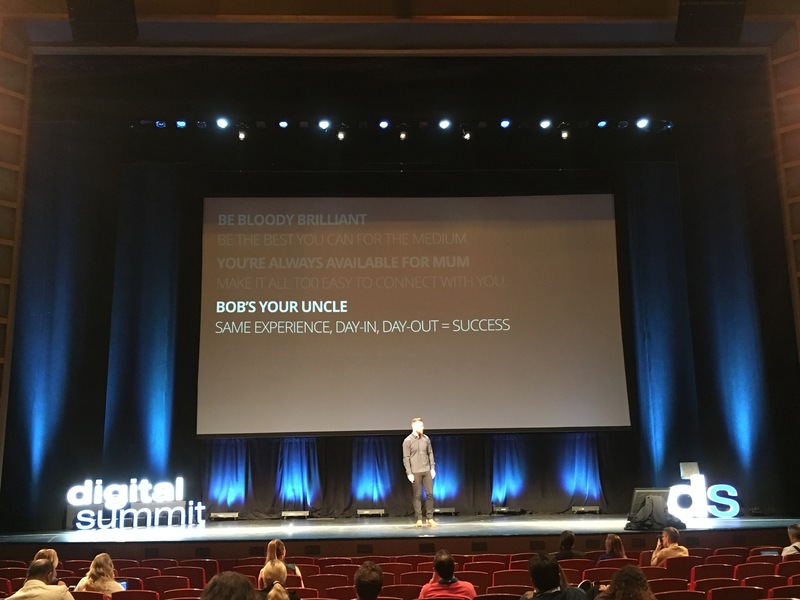 And even if you didn’t attend the actual Digital Summit itself, you can see how heavily focused the conference was on User Experience and Email Marketing. Why? Because that’s what drives conversions and brand loyalty, which in return, translates to revenue growth. So the biggest takeaway of this blog post should be that your business should be investing in email marketing and your user’s experience if you want to truly compete in the marketplace and #GainAndRetain customers. Enter your email to subscribe and have new blog posts delivered right to your inbox. If you’ve liked what you’ve read, please take a second to follow my professional page on Facebook or Twitter for more great content just like this!